There are two different air-to-ground transcripts associated with the Apollo 17 mission, the TEC or Technical Air-to-Ground transcript, and the PAO or Public Affairs Office transcript. These were both separately transcribed to typewritten pages in 1972 even though they contain 80% overlap. If you take a quick look at both transcripts you’ll see that they are formatted very differently and that the PAO transcript is in pretty rough shape. While the TEC transcript is missing many timestamps, the PAO transcript is missing far more. 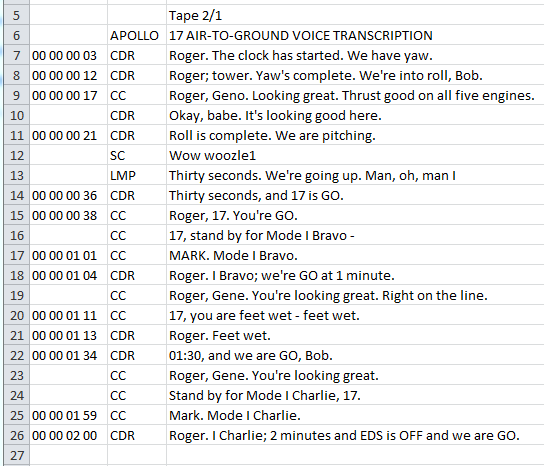 Also, the PAO transcript contains transcriptions of the live voice-over comments added by the NASA Public Affairs Officer as the mission progressed. These comments are very helpful at giving the public context on the various activities performed by the astronauts. In April of 2012 I decided that in addition to the TEC transcript that I had already spent months on, I would also need to OCR the PAO transcript. 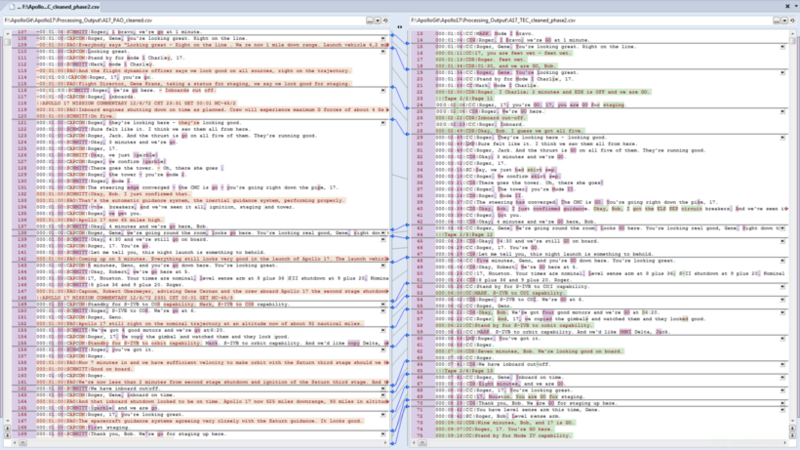 Consider these two OCR outputs. The top is the first page of the TEC transcript, the bottom is the same content from the PAO transcript. 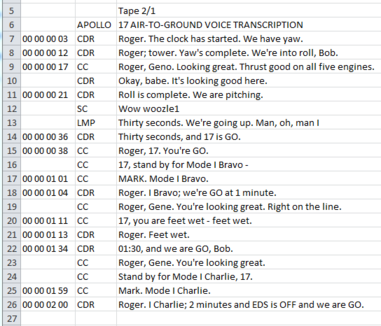 The PAO voice-over cuts over many of the communications between the astronauts and the capcom, and the transcribers interpreted many of the statements differently back in the 70s. There are very few timestamps in the PAO transcript, usually only the page title contains a general mission time when things occur. Establishing when each thing was spoken is going to be a lot of work. I’ve skipped ahead here to show you the above image. It’s a good visual representation of the marked differences between the TEC data and the PAO data. Reconciling the two would be unworkable and unnecessary in most instances. It appears that a lot more diligence went into the TEC transcription, and it’s quite possible that the recordings they were transcribing from were cleaner due to not being processed through the public affairs office. This is just a hunch on my part, but I’ve decided to make the TEC transcript the authoritative master and only use the PAO as backup when information is missing, and for extraction of the PAO commentary to include in the master. There was no doubt in my mind that the TEC transcript should be the starting point for my Apollo 15 FJ. I suspect the main difference between it and the PAO transcript is that I think the TEC was done much more slowly by people who had a fair knowledge of the Apollo jargon. I believe the PAO transcript was hammered out almost immediately after it was recorded for the purpose of supplying the press with transcripts ASAP. A good illustration of that is the acronym “MSFN”. It was pronounced ‘misfin’ and on more than one occasion, that’s exactly what was given in the PAO. For me, almost the only use of the PAO transcript is to provide the PAO commentary, which itself is historically important.